Fasten a 2-by-4 inch electrical box to the outside of the fan, using screws in the pre-drilled pilot holes. Pull the wires from the fan into the box. Open a knockout hole in the box, insert a cable connector in the hole, then insert 8 inches of the wire end of an 8- to 10-foot-long grounded power cord. Fasten the cable connector to the cord. If the fan has one black wire and one white wire, splice black to black and white to white. If the fan has two black wires, splice one to black and one to white; it doesn't matter which. Splice the green wire from the fan to the green or bare wire from the power cord. Cover your splices with wire nuts, and tuck the wires into the box. Screw the cover on the box. Fasten a 2-by-4 inch electrical box to the outside of the fan, using screws in the pre-drilled pilot holes. Pull the wires from the fan into the box. Open a knockout hole in the box, insert a cable connector in the hole, then insert 8 inches of the wire end of an 8- to 10-foot-long grounded power cord. Fasten the cable connector to the cord. If the fan has one black wire and one white wire, splice black to black and white to white. If the fan has two black wires, splice one to black and one to white; it doesn't matter which. Splice the green wire from the fan to the green or bare wire from the power cord. Cover your splices with wire nuts, and tuck the wires into the box. Screw the cover on the box. Locate the fan 6 to 10 feet from the register that you want to boost, in an area where you can easily access the fan for maintenance and cleaning. Remove the section of existing ductwork and cut off enough to fit the booster in the line. 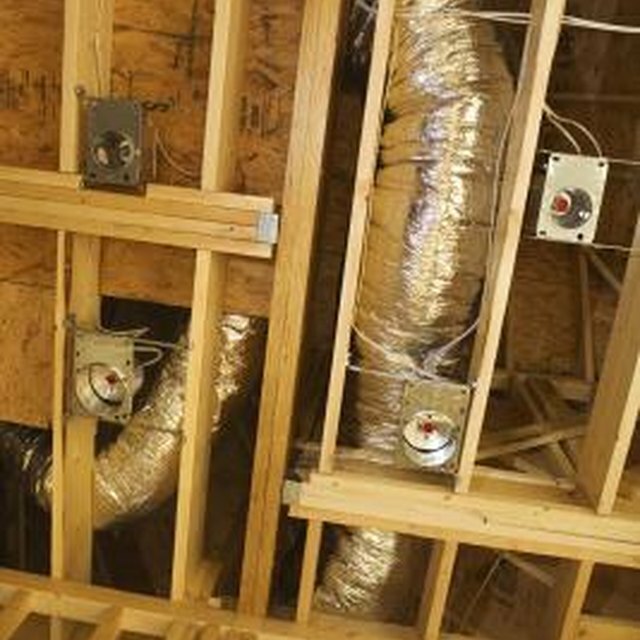 Noting the arrow on the fan that indicates the direction of airflow, crimp the ends of either the existing ductwork or the booster fan, and reassemble the ductwork with the booster in place. Seal all seams with duct tape. Find an easily accessible position for the thermostat 1 to 10 feet downstream from the booster fan. Use a mounting template for the thermostat to mark drill holes on the duct. Drill the holes and fasten the thermostat to the duct with sheet metal screws. Plug the power cord from the fan into the thermostat, and plug the thermostat into a grounded power outlet. Adjust the thermostat settings according to the manufacturer's recommendations.